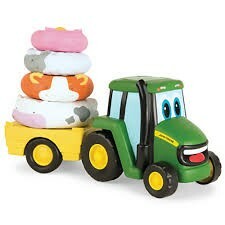 * The John Deere Farm Stackers make learning fun for your toddler! * When your child stacks the animals correctly he will be rewarded by hearing their sounds! * Once all of the animals are stacked up, push Johnny Tractor along and watch the animals spin around on the wagon. * Requires 2 "AA" batteries included.